You must have come across terms like dental implant, deep cleaning, and scaling through people who emphasize on the need for dental care in discussion or while browsing the internet. Or you must have got an advice from your dentist to get a appointment for deep cleaning. Sounds strange maybe because you already follow a regular dental check up, though you still receive the tips. May be understanding the difference between the two will help avoid the complication. The two terms might sound similar, routine dental checkup being the more common one but dental implants or deep cleaning is not new. The confusion between the two exist may be because both the process direct the person towards a common goal; a healthy smile and a healthy dental care. Just to help you eliminate complications and get a knack of the terms. Routine checkup: Routine dental checkup is a preventive step, a precaution to avoid prospective dental problems and the expenses associated with it. In a routine check up which are held once in 4 or 6 months, your dentist measures the gum tissues using comprehensive evaluation tests. If the gum measurements are within 1-3 mm with zero signs of bleeding, you’re doing fine and your teeth has no disease. If the gum measurements increase above 3 mm with visible sign of bleeding, this means the bacteria has caused your gum tissues to pull-out from your teeth, causing pockets. The situation is not very critical but it’s definitely a warning, also the right time to intervene and prevent further destruction. This is when the need for deep cleaning, scaling, and dental implants pop up. You proactively take necessary steps to put a ha;t on progressive periodontal disease. Usually the dental visits are divided into two for comfort. Dental implants and deep cleaning are inevitable process once you get dental problems, they can put a slight hole in your pocket. So, it’s recommended in the best of your interest that you do proper research. 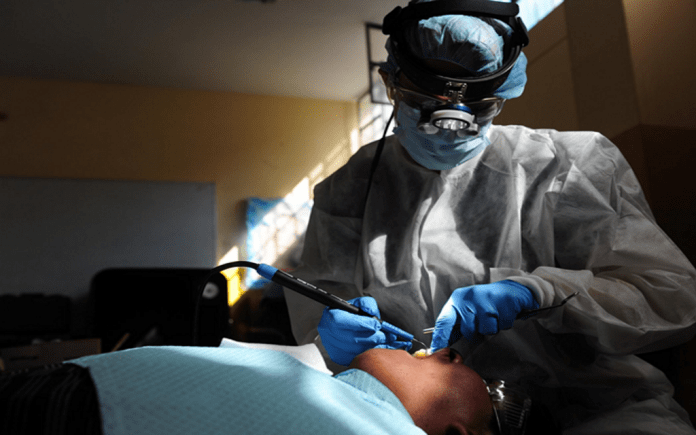 The cost of dental cleaning: A standard dental cleaning procedure can cost you somewhere close to $ 100 and insurers pay for the preventive treatments. There are certain tests that can seriously put a hole in your pocket, so ask your dentist if there is an alternate. Do you need it? If the problem is small and the dentist advises you to take an appointment for dental cleaning after a year or so, don’t worry, it’s not the right time. You can book an appointment after few more routine dental checkups. Consider a second opinion: Some dentist are legitimate ones and they actually recommend deep cleaning only when the need is real. There are few other who recommend deep cleaning to clients for income even when only routine checkup is sufficient. Check your dental insurance for coverage: There are certain dental problems that your dental insurance will cover and some which they won’t. Call your insurance agent if the expense of deep cleaning, dental implant or scaling is covered.